Chinese higher education has experienced great changes since the 1990s. The quick expansion of the system, the implementation of tuition and fees, the presidential call for the building of world-class universities, the development of Sino-foreign education programs, the massive student mobility and the mobilization of the brain circulation all took place in the past two decades. Observing those developments, one has to acknowledge that though it still faces many challenges, Chinese higher education has made great progress in many aspects. 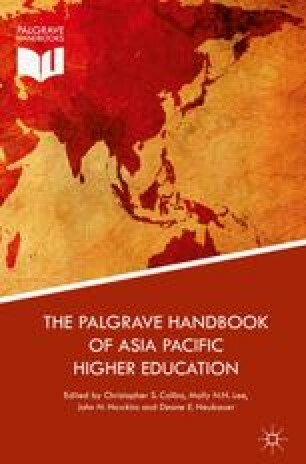 The changes in Chinese higher education shared many commonalities with other systems of higher education, but they are unique, given China’s social transition, the speed of economic development, and the global context. This chapter will provide an explanation on the uniqueness of Chinese mass higher education in the past two decades. Institute of International Education (IIE). 2014. The 2014 Open Doors Report on International Educational Exchange. Institute of International Education. Available online at: http://www.iie.org/Research-and-Publications/Open-Doors. ———. 2010. Outline of China’s National Plan for medium and long-term education reform and development (2010–2020). Beijing: Ministry of Education. Available online at: http://planipolis.iiep.unesco.org/upload/China/China_National_Long_Term_Educational_Reform_Development_2010-2020_eng.pdf.